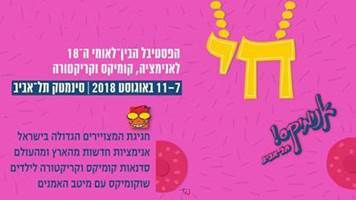 Animix Tel Aviv – the annual Israeli International Animation, Comics, & Caricature Festival will take place from August 7 – 11, 2018 at the Tel Aviv Cinematheque. Now in its 18th edition, the festival features full-length features for adults and children, animation from Annecy and the Oscars, and new Israeli animation, as well as exhibitions, artist panels, lectures, and workshops. The full program, schedule and ticket information may be found on the Animix website. Award winning animator and director Sharon Gazit, founder and creative director of Pil Animation, will be honored at the festival. One of my favorite Gazit films is “Eyes to Toes” an independent film in black and white, with a painterly quality, a paen to music and movement. Cartooning artist Tayo Fatunla will be a special guest at this year’s festival. Cartoonist, illustrator, storyteller and more, Tayo Fatunla was born in England and grew up in Nigeria. After working as a cartoonist for several Nigerian publications, he studied art at Kubert Art School in New Jersey, in the 1980s. His publications include two books on Black history, and he has participated in Nigerian projects such as Spirit of Lagos, a children’s educational comic. Fatunla will give a talk on his landmark work Our Roots, for which he received a lifetime achievement award this past May, on Thursday, August 9th , he will present a talk about his life and work on Saturday, August 11th, and conduct a workshop for kids and teens on caricatures on Thursday, August 9th. Performance at an exhibition – at the center of this event is the piano suite Pictures at an Exhibition, by Modest Mussorgsky. Following the untimely death of his friend, the designer and artist Viktor Hartman at age 39, a memorial exhibition of 400 works by Hartman was on display at the Imperial Academy of Arts in Saint Petersburg during the months of February and March 1974. Inspired by Hartman’s work, Mussorgsky composed Pictures at an Exhibition over the course of three weeks in June, 1974. The concert will be performed by Gil Shohat, accompanied by contemporary animation inspired by the subjects of the original Hartman exhibition. Dudu Shalita and Gil Shohat will also provide commentary on the music and the art. The concert will take place on Saturday, August 11th at 10:30 and is suitable for all ages. Tickets and additional information on this link. Black and White in Color – an anti-racist medley of animation curated and presented by Dudu Shalita. Thursday, August 9th at 20:00. Tickets and additional information on this link. A tribute to ABBA – Nissim Hezkiyahu will conduct a tribute to the ever-popular Swedish band with one of my favorite opera singers Yael Levita, conductor Dudi Zeba, and guest Eyal Gersh. Saturday, August 11th at 21:30. Tickets and additional information on this link. King Lear and Queen Lia – a tribute to a star of the Israeli stage Lia Koenig, with animation, caricatures and stories of her life and work. Saturday, August 11th at 17:00. Tickets and additional information on this link. Animix Artistic director: Nissim Hezkiyahu, Animation curator: Dudu Shalita, Producer: Galit Bersky.